This time last year I was working on the 12-week creativity workbook The Artist's Way by Julia Cameron. And last night, I felt moved to return to her concept of Happiness Touchstones. It seems so relevant in this month of busy rushing - which, let's face it, is only the lead-up to more busy rushing in December. But most of all, this time of year is supposed to center on gratitude. Brainstorming my own Happiness Touchstones never fails to help me give thanks, especially when many of them are so small that I can incorporate them into my world everyday. And the ones that are more infrequent? If they give me joy, maybe I can try to seek them out more often, or give extra thanks when they do come around. 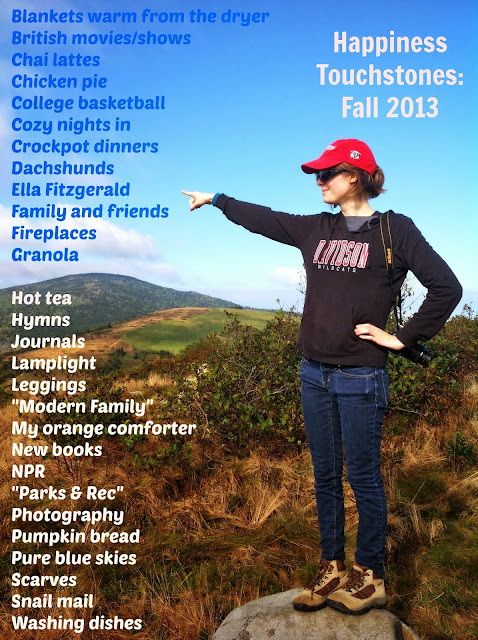 This is specifically my Fall Edition of touchstones, because as you'll see, so many are associated with warmth and coziness, out of the cold. I'm going to make another list in the spring or summertime, because I imagine they'll change a bit. But in the meantime: Think on your own Happiness Touchstones. Write them down, if you like. Make a collage like I did below, using PicMonkey. Or share with me! I'd love to hear them.